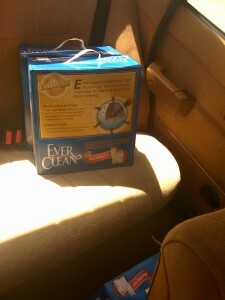 But this time I got the kitty litter first! Jesus must really want my car. 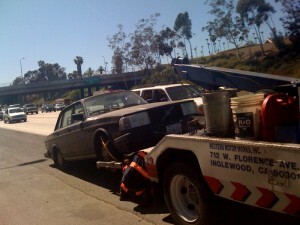 The Volvo got raptured again yesterday while I was attempting to drive home from the Hammer on the 10 freeway. There I was, just minding my own business and sweating it out driving in stop-n-go traffic eastbound towards my house. When I drive, I like to pick up the “heavy” stuff I can’t really haul on a bike. So I had 75 pounds of kitty litter with me, plus 3.5 pounds of cat food and 6 pounds of rye flour from the health food store. I thought everything was going swimmingly with the car. I’d gotten it back from the dude last week and immediately got on an airplane to Detroit. I came home and figured we were back to normal. Did the errands, met some nice folks over at the Hammer and then tried to get home. Called AAA again and they sent out a tow. Got to stand on the side of the freeway and take pictures of the ridiculous scene for a bit. 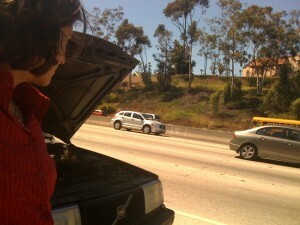 Not often you get a chance to hang out on the shoulder of the 10. Some sweet-faced CHP officer stopped to see if I was OK. I swear, he looked like he was 14. He told me I should get in my car, but I said I’d die of the heat. You don’t leave pets in parked cars, do you sonny boy? So he said I could just stand far away from the cars. I thought he said he’d stay with me until the tow truck came, but he left in a hurry. A few minutes later, his partner stopped by and asked me if his partner had been there. I said, well, if they’re partners, how come they were in separate cars? He said, “beat partner,” which means, well, I’m not exactly sure. I guess I was still thinking Ponch and Jon. I got back to the mechanic’s place and they were kind of surprised to see me. 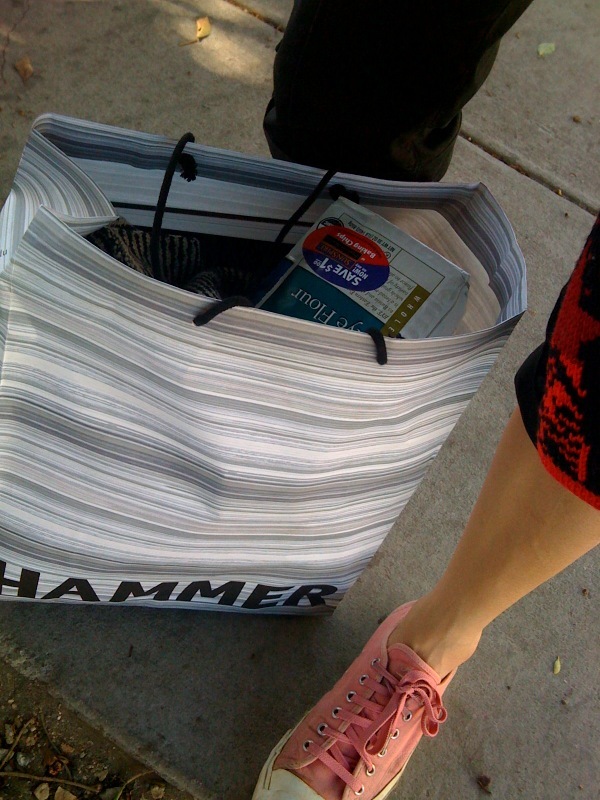 They’ll take a few days to attempt to figure out what’s wrong with the car, so I packed up my Hammer shopping bag, got out of my fancy shoes and into a pair of sneakers I kept in the trunk, and hoofed it home. Unfortunately, it was 90 degrees out. I didn’t have socks, so I got blisters from my sneakers. The bottom fell out of the Hammer bag a few blocks from my house. I didn’t lose anything, but I could tell the neighbors were wondering why I was carrying around a bag of art books and rye flour.